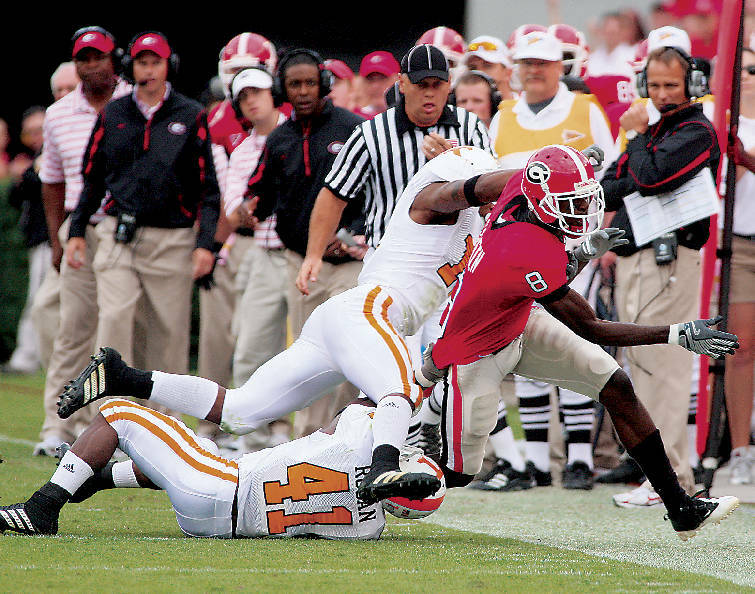 Staff Photo by Dan Henry UT's Eric Berry (14) and Dennis Rogan (41) push UGA's A.J. Green (8) out of bounds during the first half of play Saturday afternoon. The Bulldogs won over the Volunteers during a sold out game at Sanford Stadium with a final score of 26-14 Saturday October 11, 2008. KNOXVILLE -- If Janzen Jackson and Darren Myles Jr. hadn't been put under enough pressure to perform as Tennessee true freshmen, Eric Berry sealed it Wednesday afternoon. Berry -- a unanimous All-American last season as sophomore who is on pace to smash several UT, Southeastern Conference and NCAA records -- said both freshmen safeties are more ready to play than he was his first year. That would be a sight to see. Berry's first two collegiate seasons have featured 158 tackles and 12 interceptions returned for 487 yards -- 14 yards shy of former Florida State star Terrell Buckley's NCAA record. "As soon as (Jackson and Myles) learn the playbook, I feel like they're going to be incredible," Berry said after Wednesday's three-hour practice. "Y'all look at me now and think of me as this guy, but they came in here with a lot more natural ability. Seeing how they get to the ball and some of the plays they make, it's pretty incredible." Several reporters asked Berry to confirm that bold comment. He didn't hesitate. "They're great athletes right now," he said. "They just need to learn their playbook, and they'll be great. They're going to be great competitors at this school." And either of them -- particularly Jackson -- could lineup alongside Berry as a starter Sept. 5, when UT opens the Lane Kiffin era against Western Kentucky. Kiffin's Volunteers don't have enviable depth at many positions, but cornerback and safety are exceptions. In fact, Kiffin said the biggest problem will be settling on four starters. Former first-teamers Brent Vinson and Dennis Rogan are playing well, but they're still stuck on the second unit in most drills and team periods. Rogan, redshirt freshman Prentiss Waggner, sophomore Anthony Anderson and Jackson have taken turns with Berry -- the only entrenched starter on either side of the ball, according to Kiffin. "I think what you're seeing is unique depth in the secondary," Kiffin said. "It's probably easily our deepest position, and so what happens is a lot of times the 2s go in, and there's someone you can pick on and go after. "But when our 2s go in, shoot, Brent Vinson and Dennis Rogan are in our 2s. Those are pretty tough guys to go against." Kiffin called the second safety starting spot "wide open." "We need consistency there, because we're going to do so many things with Eric," Kiffin continued. "It's going to be really interesting to see who is going to make the plays, and who is going to move around and play other positions." Jackson -- who, along with Myles and other freshmen, hasn't been made available to the media -- has drawn rave reviews through two practices. The 5-star recruiting coup from Louisiana isn't imposing at 6-feet, 184 pounds, but Kiffin said the youngster already covers like an SEC cornerback and hits like an SEC safety. Rogan called Jackson a "really aggressive" player who has "really turned some heads out here." "Both of those freshmen safeties have been great," Kiffin said. "Janzen's so physical, and he's so fast. He could be a corner if we needed him to be. We've just got to figure it out. "We've got a unique secondary in that so many of the guys can cover and play safety. You've got Rogan in that group, as well, and Eric can play nickel. We've got to figure out pretty soon here who's going to play where and make sure we put the other guys in position to be able to play on gameday." Junior wide receiver Brandon Warren admitted his injury-riddled corps has struggled in late-practice drills against the deep secondary. "I see a lot of competition out there," Warren said. "The whole secondary, everybody's out there competing. We've got some good young guys out there in the mix, too. That's not going to do anything but create some depth, and get guys ready to play. They're out there hungry, and Eric's leading the way for them. "It gets tough, but you've just got to be mentally tough and fight through it. There's going to be times when you feel like you're down, and you can't go another play, but you've got to pull it out." As much as Berry praised Jackson and Myles, he added more-experienced players like Rogan and Waggner wouldn't simply surrender their jobs. If anything, Berry said, the players who went through spring practice are more familiar with coordinator Monte Kiffin's defense and better-suited to succeed if the season started today. But of course, the season doesn't start for more than four weeks. "Everyone else at safety ... if I go down, I have no worries," Berry said. "Those guys can come in and fill in and do what I do. They're really just all working, all taking care of business. They pretty much all know the playbook. "The younger guys still have got some ways to go, but guys that were here this spring, I feel like they could come in and take over."